Settings have now been changed so you should be able to see this. Our clockwise route takes us "down" the steep Hardnott Pass. The video, below, is me riding down it last Friday in fine weather, dry roads and no traffic, well apart from a cyclist lower down! It doesnt look steep in the video but its 30 degrees, bumpy and the hairpins are tight. The top bend is the tightest /steepest and has an adverse camber , but if you approach it on the right hand side of the road (as shown in the video) its easy. My main concern is that it is much more difficult if there is upcoming traffic on these top 3 hairpins, or if a vehicle in front stops in the wrong place. Other vehicles may not consider the space needed for a motorcycle coming down and I want to avoid this potential hazard. So, my plan, as lead bike, is to pause before the top bend and wait for the top 3 bends to clear. 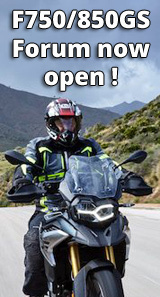 Riders can then use the full width of the road going down, which means you can fully enjoy the Hardnott experience and not be stressed wondering what other vehicles are going to do! I will also stop traffic coming up unitl the group is safely down. Its a single track road, so the group can continue riding down the pass and along the road to a railway station car park on the right about a mile or so (there are nearer laybys but these will probably be full of cars ). For those who havent done Hardnott before, I hope this helps. Note to all: Lakes to be avoided on Sunday 12th May due to the Fred Whitton cycle race. I have been told that the major passes will be closed this year during the race. So, I will provide a Sunday route around the Yorkshire Dales for anyone interested. I was really looking forward to 2 days of the Lakes (particularly given the distance from home), clearly nothing to be done about it but still count me in for Sunday on the Dales, we had some great riding there on the 2017 Megameet ….. Wensleydale Creamery cheese factory for lunch again? There will be 6 of us travelling up on the Friday from South Wales. Justin and Kerrie may join us from Stroud too. Ideally will avoid motorways until Chester way. Open to anyone else tagging along too. I’ll PM you on FB, Russ with potential routes. Like tigeruss I similarly will be riding alone this meet, T800XC has pre-plans and Rozzer (fingers crossed, with bike) probably plans on straight lining up on the Friday. If you would keep me updated Dai (not on FB) I could possibly be in the Chester area at the right time. As with the previous meets I've attended I've arranged to make the most of it and as I finish work Wednesday and took Sun/Mon nightshift off as holidays. After Plymouth to Newport by motorway I have mapped myself a (hopefully) twisty route from there heading north through Abertillery, Ebbw Vale, Merthyr Tydfil, Brecon, Builth Wells, Newtown, B3482 and doing the loop around Lake Vymwy and up through Snowdonia to Betswy-Y-Coed where I plan to stay the night in the same B & B I used for the last N.Wales meet. So early'ish breakfast Friday and set off around 8. I had thought I may meet up with T800XC for a route though the Peaks and Dales but with the Dales planned for Sunday, if meeting up doesn't look convenient and given the total amount of riding and saddle time I might head straight up, via previous suggestion of Lakes to destination and grab a few hours relax/nap before the evening meet.